Asthma medications are the foundation of good asthma control. This handout has been prepared to help you understand and follow your or your child's asthma action plan. Learn all you can about your or your child’s asthma medications. Know what medications are included in the action plan, when these medications should be taken, their expected results and what to do when they fail. There's no medication to cure asthma. Asthma medications are used to stop, control and prevent asthma symptoms. Most people need to take more than one type of medication to control asthma. Not everyone with asthma takes the same medication. There are many different asthma medications and they come in many forms: pills, aerosol inhalers, powder inhalers, liquids and injections. Asthma medications are often divided into two groups: bronchodilators and anti-inflammatory agents. Make sure that you understand and share the same treatment goals as your or your child’s doctor. Talk about what you expect from medications so you can know if the treatment plan is working. The way the body responds to medications may change over time, so medications may need to be adjusted. Tell the doctor if you notice a difference in how well the treatment plan is working. Refer to the asthma action plan when deciding how or when to use medications. This plan will be designed for the best asthma control. Make sure you understand and can follow the plan. Wash your hands prior to preparing or taking medications. Take your time. Double-check the name and dosage of all medications before using them. Keep medications stored according to the instructions given with the prescription. Never run out of medications. Call the pharmacy or doctor's office at least 48 hours before running out. Know your pharmacy phone number, prescription and clinic numbers, medication name and dose so you can easily call for refills. Inform the doctor about any other medications being taken. Medications can work differently when taken together. Asthma medications are very safe. However, side effects can occur and vary depending on the medication and dose. Ask the doctor to describe medication side effects. Report any unusual or severe side effects. These are the most important medicines for most people with asthma. Anti-inflammatory medications reduce swelling and mucus production in the airways. As a result, airways are less sensitive and less likely to react to triggers. These medications need to be taken daily and may need to be taken for several weeks before they will begin to control asthma. Anti-inflammatories lead to fewer asthma symptoms, better airflow, less-sensitive airways, less airway damage and fewer asthma episodes. If taken every day, they control or prevent asthma symptoms. Theophylline is another type of medication used to treat asthma. It is a bronchodilator, which will be explained later. Anti-inflammatory medications are some of the most important treatment options for people with asthma. They prevent asthma attacks and work by reducing swelling and mucus production in the airways. As a result, airways are less sensitive and less likely to react to asthma triggers. Direct anti-inflammatory medications include corticosteroids (inhaled and oral). Other controller medications that will be discussed here are mast cell stabilizers and leukotriene modifier medications. Although not true “anti-inflammatory” medications, they work with corticosteroids to augment the anti-inflammatory action. Inhaled corticosteroids are the most effective medications to reduce airway inflammation and mucus production. The use of these medicines leads to better asthma control with fewer symptoms and flare-ups and less of a need for hospitalization. Inhaled steroids prevent symptoms; they do not relieve symptoms. Dosages vary and inhaled steroids need to be taken every day for best results. Some results are seen in 1 to 3 weeks, with the best results seen after 3 months of daily use. Inhaled corticosteroids in metered dose inhaler (MDI) form work best when used with a spacer device. Dry powder inhalers (DPI) are the newest delivery devices and do not use a spacer. Budesonide (Pulmicort® Turbuhaler), fluticasone (Flovent® Diskus), and mometasone (Asmanex® Twisthaler) are inhaled steroids available in DPI form. Budesonide is the only corticosteroid available in nebulizer form (Pulmicort® Respules). Side effects: Side effects will depend on the dose. There are few side effects with lower doses. At higher doses, thrush (yeast infection in the mouth) and hoarseness may occur, but are not common. Rinsing the mouth after each use and using a spacer device with MDIs will help prevent these side effects. Forms: Oral forms of corticosteroids are used to relieve severe asthma episodes. These drugs are always used with other medications to either control sudden and severe asthma episodes or to treat long-term, hard-to-control asthma. Oral corticosteroids take 3 hours to begin working and work best after 6 to 12 hours. Sometimes corticosteroids are taken in high doses for a few days (steroid burst), in a lower dose daily, or every other day for long-term control. Side effects: Long-term use can cause acne, weight gain, mood or behavior changes, upset stomach, bone loss, eye changes and slowing of growth. These side effects can rarely occur with high doses of inhaled steroids or short-term steroid bursts. Forms: Mast cell stabilizers are only available in inhaled forms. They prevent asthma symptoms and need 3 to 4 weeks to begin working. Mast cell stabilizers need to be taken 2 to 4 times a day to control asthma long-term. Intal® can also be used 30 minutes before exercise to prevent exercise-induced symptoms. Side effects: These medications are very safe and have few side effects. Tilade® can cause dry throat and can have a bad taste. Forms: Leukotrienes are chemicals that occur naturally in our bodies and cause tightening of airway muscles and production of mucus. Leukotriene modifier medications work by blocking the actions of leukotrienes in the body. Studies are showing that these medications are helpful in improving airflow and reducing asthma symptoms. They are taken as pills 1 to 4 times a day and have been shown to decrease the need for other asthma medications. They are best for mild asthma or in combination with steroids in moderate or severe asthma. They also help treat allergies. Side effects: The most common side effects are headache and nausea. Leukotriene modifiers may change how the body responds to other drugs, like warfarin (Coumadin®) and theophylline. Inform the doctor about any medications being taken. Other side effects may be found as these medications become more widely used. Short-acting beta2-agonists are rescue medications that relieve symptoms very quickly. They work within 20 minutes and last for 4 to 6 hours. They are the medications to use 15 to 20 minutes before exercise to prevent exercise-induced symptoms. 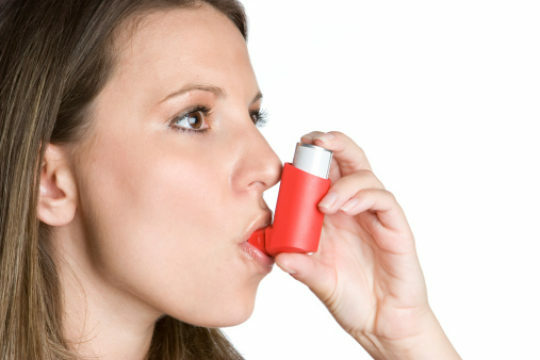 The inhaled forms are the best for treating sudden and severe or new asthma symptoms. Overuse of short-acting beta2-agonists is a sign of unstable asthma and a need to adjust control medications. Combination medications: salmeterol and fluticasone (Advair®); formoterol and budesonide (Symbicort®). These contain both the long-acting beta2-agonist and an inhaled corticosteroid. Symbicort® has recently been approved by the FDA. The long-acting forms of beta2-agonists are used for better control, not for relief. These drugs take longer to work and the benefits last longer, even up to 12 hours. Salmeterol (Serevent®) and formoterol (Foradil®) are the only inhaled, long-acting beta2-agonists. They are used twice a day to maintain the open airways for long-term control. This is especially helpful overnight. Formoterol has also been shown to be helpful in exercise-induced asthma, as it begins to work more quickly than other long-acting beta2-agonists. Salmeterol and formoterol are available in dry powder inhalers (Serevent® Diskus and Foradil® Aerolizer). Side effects of beta2-agonists: Nervous or shaky feelings, over-excitement or hyperactivity, increased heart rate, and (rarely) upset stomach or trouble sleeping. Albuterol is available in oral form as pills or syrup. However, due to higher doses, oral forms of these medicines tend to have increased side effects and are not often prescribed. There are two anticholinergic bronchodilators currently available—Ipratropium bromide (Atrovent® HFA), which is available as a metered dose inhaler and nebulizer solution, and tiotropium bromide (Spiriva®), which is a dry powder inhaler. Ipratropium is used 4 times per day whereas tiotropium is used only once per day as its action lasts for 24 hours. These are not quick relief medications but medications that can enhance the bronchodilator effect for certain asthmatics with difficult-to-control symptoms. Although not commonly used to treat asthma, they can be of benefit to some patients. Side effects: Side effects are minor; dry throat is the most common. If the medicine gets in your eyes, it might cause blurred vision for a short period of time. Forms: This medication is available only in the oral form. It is long-acting and prevents asthma episodes. It is used in difficult-to-control or severe asthma. It must be taken daily and doses cannot be missed. Blood tests are required to monitor therapy. Side effects: Nausea, vomiting, diarrhea, stomachache, headache, rapid or irregular heartbeat, muscle cramps, jittery or nervous feelings and hyperactivity. These symptoms may be a sign of too much medication, so blood levels need to be checked regularly. Certain medications--such as antibiotics containing erythromycin, seizure medications and ulcer medications--can interfere with the way theophylline works. Cigarette smoke and viral illnesses can also change how the body responds to theophylline. It is important to always tell the doctor when theophylline is being taken for asthma. There are some inhalers that contain a combination of two different medications. These inhalers allow both medications to be delivered from one device, shortening treatment times and decreasing the number of inhalers that need to be purchased. Advair®, a combination of fluticasone (Flovent®) and salmeterol (Serevent®) is one such product, as is Symbicort®, a combination of budesonide (Pulmicort®) and formoterol (Foradil®). Another medication is Combivent®, a combination of albuterol (Proventil®, Ventolin®) and ipratropium bromide (Atrovent®). Although Advair® is commonly prescribed in asthma treatment, Combivent® is more frequently used in the treatment of other lung diseases. Symbicort® has been approved by the FDA and should be available in the near future. The newest medication used to treat moderate to severe persistent asthma in patients who are also allergic is omalizumab (Xolair®). Allergic asthma occurs in 6 out of 10 people with asthma. An allergy specialist can determine if you are allergic by either performing a skin testing or obtaining a RAST blood test as well as checking the IgE level in your blood. IgE (Immunnoglobulin E) is an antibody that is present in allergic individuals. Xolair® is a medication that blocks IgE in your body and may help to relieve symptoms and control asthma in individuals who have persistent symptoms despite maximal medical treatment. It is an injection given every 2 to 4 weeks, depending on your specific IgE level in the blood. If you have asthma that is not well controlled and you are allergic, discuss the use of this medication with your health care provider. Q: Can medicine cure my asthma? A: There is no cure for asthma. However, following an asthma action plan can help to keep asthma under control. Q: Why do I have more than one kind of asthma medicine? A: There are basically two different types of asthma medication: controller and reliever medicines. Remember, asthma is inflammation of the airways in the lungs. Unless you have very mild asthma, you probably use both types of medicine. Long-term preventive medicines are those that are taken on a daily basis, to keep the airways stable and control asthma symptoms. Reliever or rescue medicines are taken during an asthma episode (to stop the symptoms of coughing, wheezing and shortness of breath) or prior to exercise to prevent symptoms. Q: Is it safe to use an inhaled steroid every day? A: Inhaled steroids are the medication of choice to treat chronic, persistent asthma. They provide long-term control to prevent asthma symptoms. Unlike oral forms, inhaled steroids are considered safe to use on a regular basis. When taken correctly, the medication does not enter the bloodstream and, therefore, side effects are eliminated. Local side effects such as hoarseness, yeast infection in the mouth and coughing can be avoided by rinsing the mouth and gargling with water or mouthwash after each use, and by using a spacer device with metered dose inhalers. Discuss any concerns you have with your doctor. Q: Will I always have to take asthma medicine? A: How often you need to take your asthma medication depends on how severe your asthma is and how frequently you have symptoms. For example, if your asthma symptoms occur only during a certain time of the year when your allergens are present, then you may only have to take medications to control your symptoms during that time. However, this is somewhat unusual and most people with asthma need to take daily control medications. Discuss your care plan with your doctor.